First things first—in this article dated 12/18/2011 http://tallahasseeo.com/2011/12/18/a-letter-from-our-reader-carissa-chambers-regarding-corruption-of-leon-county-sheriff-larry-campbell/ I stated that my son, DeShon Rashard Thomas, was “Neutral” about his ex-girlfriend, Laqecia Herring (deceased) being pregnant with his child. It was the LEON COUNTY SHERIFF’S DETECTIVES—NOT Laqecia Herring and Sterling Conner Jr’s FAMILY MEMBERS who assumed that there was hostility between my son and Ms. Herring. According to reports, this BOLDFACED LIE about the VICTIMS FAMILY MEMBERS stating that there was hostility between DeShon Thomas and Laqecia Herring was presented to judges, the media, and the Grand Jury which led to signatures on search warrants, arrest warrants, and an indictment by the Grand jury. With friends like Assistant State Attorney Jack Campbell, who needs enemies? After my son was charged with 2 counts of 1st Degree Murder, he sat in jail for over 30 days without a public defender. I called and visited the Public Defender’s office on several occasions trying to find out what public defender was assigned to my son’s case. Each time I was told that it was still in the Conflict Counsel’s Office and had not yet been assigned to anyone. Acting on a referral, I met and eventually retained Mr. Gregory Cummings on March 12, 2011 to represent my son. According to the Docket Report on Case Process, the public defender who was assigned my son’s case– name doesn’t appear until March 21, 2011. He then withdraws from the case on March 23, 2011. Coincidence or… Oh it gets deeper, but I’m going to leave that part right there for now. Fast forward to July 18, 2012, I finally “smelled” the stink with my son’s attorney and I told him to fire him. I’ll also leave that right there for now. 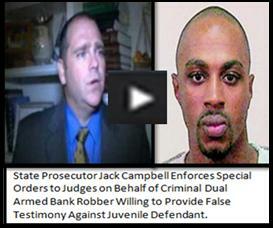 Now as far as Assistant State Attorney Jack Campbell and my son’s ex-attorney, (shaking my head). My son’s trial date has been reset 3 or more times in 2012—all State’s Motion for Continuance. What defense attorney who tells his client and his client’s family that he’s prepared to go to trial– allows his client to catch another charge, especially a charge such as Conspiracy to Commit Murder against a witness. That Conspiracy to Commit Murder charge against my son alone just super strengthened my complaint. When I hired this attorney to represent my 17-year-old son on two counts of 1st Degree Murder, I thought that he’d at least hire a private investigator, interview some character witnesses, verbally open up the Discovery Report more with my son—you know build a strong defense case or at least act like it. Because as an experienced attorney, he should know that a 17-year-old won’t know exactly what he’d be reading if the Discovery Report was handed to him. Oops!!! That’s where I came into play at. Well, at least up until I told my son to fire his attorney. So now Assistant State Attorney Jack Campbell throws my son’s ex-attorney under the bus. Then he keeps it in the family with his dad Sheriff Larry Campbell, by preventing me (my son’s only source of real truth and BS detector) from visiting him. So now my son who is now 19-years-old has no way of contacting me or anyone else as far as learning who’s his new attorney. On Friday when my son called me to tell me about this Conspiracy charge, when I mention the words “the attorney that I spoke with”, the phone went dead. My son didn’t call me back. Since my son has fired his attorney (shaking my head), he’s been charged with Conspiracy to Commit Murder against a witness, placed in confinement (where he can’t receive any visits from anyone other than an attorney. The majority of his family lives over 300 miles away). I mean seriously, what next? Whose idea was it to tell wctv.tv to leave my son’s mug shot up on their website for 2 days? Whoever, recommended it to wctv.tv, please tell wctv.tv to post the original Probable Cause Report for the 2 counts of 1st Degree Murder charges that is dated February 7, 2011. For whatever reason, wctv.tv started posting the Probable Cause Reports online a month or so after February. Will you please ask them if they can retro back? DEMOCRATS VOTE OUTSIDE THE BOX—VOTE FOR LISA SPRAGUE!!! IT’S NOT ABOUT PARTY AFFILIATION—IT’S ALL ABOUT WHO IS GOING TO DO THE RIGHT THING!! !